Make an appointment at the Clinic (of the Law School) ! Researchers have started studying the impact of students’ use of computers in class on the quality of student learning. This article summarizes the existing research. Overall, research tends to suggest that the ubiquitous use of computers in class by students generates a drop in student attention (both the students using the devices and their neighbors) and reduces the quality of note-taking. In a following article, I’ll discuss the results of this research, asking whether the use of computers should be banned altogether? Slowly but surely, computers have been replacing pens and paper as students’ preferred tool to take notes in class. Professors are now sometimes facing walls of computer screens, with students watching these screens (not the professor), their eyes showing emotions that can be quite remote from what the topic being discussed in class should make them feel. Are computers and access to the Internet creating too many distractions for students using computers ? Are computers creating too many distractions for the neighbors of students using computers ? Does using computers reduce the quality of note-taking compared to the traditional pen and paper ? This article summarizes the results of research conducted to answer these three questions. In a following article, practical solutions will be given to professors to help them with this issue. Students who take notes on computers are often distracted by other activities they can easily engage in through their computers, such as surfing on the internet or using social media (e.g. Maxwell, 2007). The use of computers can reduce students’ attention in class because of two cognitive biases: a present bias and an optimism bias. David Laibson, an economics professor at Harvard University who specializes in behavioral economics, explains how the present bias works: students often come to class with the best intentions regarding their concentration during class. But once they are sitting in their seats in front of their computers, they can prefer the immediate satisfaction of an easy distraction offered on their computer screens thanks to their internet connections. Time goes by, and students end-up having missed a significant part of the lecture. Students, however, may think that this is not much of a problem, because they believe that they will be able to catch-up the parts they missed later on (optimism bias). The use of computers in class can therefore encourage students to procrastinate, and reduces the efficiency of the time they spend in class. This effect is generally reinforced by another manifestation of the optimism bias, regarding students’ belief in their aptitude to multitask. For instance, many students believe that they can listen attentively in class, while using social networks. However, students tend to overestimate their ability to multitask. Research in psychology shows in a very convincing manner that students are less attentive when they multitask on their computers during class (e.g. Hembrooke & Gay, 2003). As a result, students understand and learn on average less in class. They also tend to participate less in class discussions. Students themselves tend to declare that using computers (and cell phones) creates incentives to reduce their attention in class (e.g. McCoy, 2013). Computers can produce a negative externality on neighboring students’ concentration. While daydreaming students do not bother other students, students who have their screens up and are visibly active on social networks generate temptations for neighboring students, thus decreasing their level of attention in class. Research has shown that students who are distracted on their own computers tend to also reduce the attention in class of their neighbors (e.g. Sana, Weston & Cepeda, 2013). Students complain that the distractions caused by their neighbors’ screens (and the noise of their typing) are a major obstacle to their ability to concentrate in class (Fried, 2008). Researchers have also studied the impact of note-taking on computers (without distractions), with the traditional paper note-taking method. 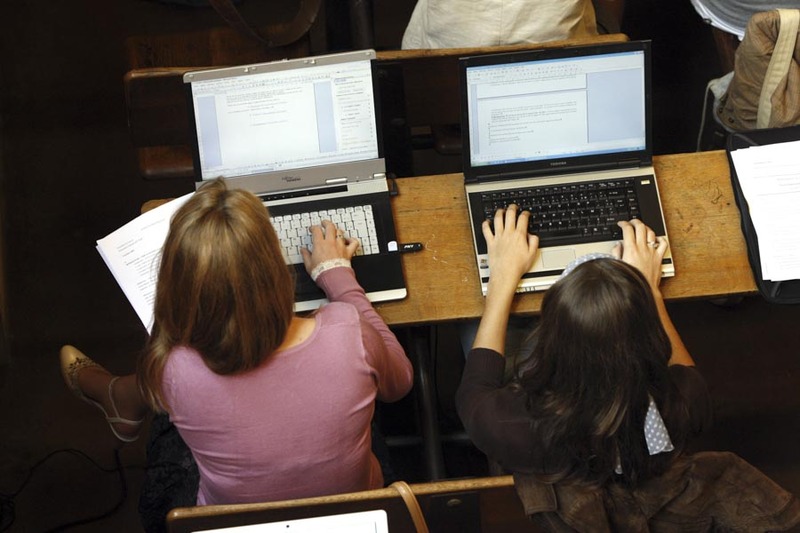 Note-taking on computers enables students to write faster than writing on paper. This could have a positive impact on learning, but research actually suggests that writing on paper forces students to think about the information they are receiving in order to synthesize concepts. This traditional note-taking method therefore forces students to think about content more. However, the student who takes notes on a computer is more able to type every word. Students who type on computers therefore tend to be more passive note-takers, reducing the quality of learning. Students who take notes on computers instead of paper tend to give lower-quality answers to questions asking to apply the concepts covered in class (Mueller & Oppenheimer, 2014). Although causality can be hard to prove, research on the three questions above tends to suggest that, overall, the use of computers in class by students to take notes has a negative impact on learning. For more information on the research showing the negative impact of note-taking on computers, you can also read this article posted on the website of the Brookings Institute, and written by Susan Dynarski, professor of public policy, education and economics at the University of Michigan. McCoy, B. (2013). Digital distractions in the classroom: Student classroom use of digital devices for non-class related purposes. Journal of Media Education, 4(4), 5-15.